Many of you are aware that I've struggled to find a good audio book, and only a few this year have been exceptional to me. Thankfully, those successes have convinced me that I need to continue to include audio as part of my book experience. Had I listened to A Fair Maiden, by Joyce Carol Oates as my initiation to it all, however, I probably would have waited even longer before picking up my next audio book. Katya is sixteen-years-old and is a nanny to a wealthy family in New Jersey. While in the park with the children, she meets Marcus, a man in his sixties who seems harmless enough. She agrees to visit him in his stately mansion and becomes "friends" with him. Soon, though, the friendship she believes she's developed becomes something quite different, and altogether deeply disturbing. 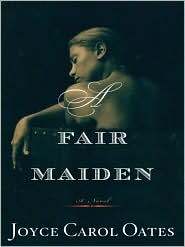 It's not as though A Fair Maiden isn't interesting. It is. The characters were interesting. The storyline was interesting. The narrator was decent. But this story, for some reason, even with all of these elements combined into a dark and unsettling relationship with shocking moments, still wasn't memorable enough for me. There was a part of me that felt I had heard this story many times before, so I was struggling to find the uniqueness. Although I was engaged enough that I listened to the short six hours in one Sunday afternoon, and while I hoped for Katya to break away from the life she lives and the men she seems to always be around, I concluded the audio and didn't feel a significant emotion for it. I will point out that while I'm not squeamish about most things in books, there were scenes in which I felt became even more disturbing simply because I was listening to it happen versus reading it. That, I found, was difficult. So perhaps, in fact, it was memorable for me? I'm still up in the air on this one. Have you read it? This was my first time experiencing Joyce Carol Oates. I know she is a popular author, so I will certainly try her work again. I haven't read this one...but in general, I think JCO is known for her disturbing books and flawed characters. I like her writing, but I am not always comfortable with her stories. I think the story sounds okay - good for when you don't want something with that involves too much thinking. Hope you like Never Let Me Go better - I think the narrator would be the make or break point for this book. I hadn't read this one, but my previous experience with Oates makes me think she certainly doesn't shy away from dark and disturbing! Oates is very dark and disturbing! I love We Were the Mulvaney's (my first book of hers) and I just finished her most recent collection of shorts stories Sourland - some stories I loved, and some were just too disturbing and I struggled to complete them. She's a talented writer, but definitely not for everyone. I'm the same way you are - I can read lots of things that I could never watch or listen to. I think I'll skip this book - thanks for your review. The jury is still out on whether or not I like audiobooks. Everything is all in one voice, and often it's not the voice I imagine in my head when I'm reading. Writing, grammar, sentences, word usage, these are all still so much more enjoyable using my eyes rather than my ears. I won't give up on audiobooks just yet though, they are handy for when I go out on long walks. Doesn't sound like it's one for me but I did like your review and honesty. I struggle with audio books too. I desperately want to like them. I rarely listen to adult audiobooks, but I've found many enjoyable children's/YA books on audio. (I'm usually listening in the car with my kids.) My two favorites are The Graveyard Book by Neil Gaiman and A Drowned Maiden's Hair by Laura Amy Schlitz. I would happily listen to them again. Uh-oh...the relationship between the main character and the old man sounds suspiciously like the center relationship in Coffee and Fate, which I have to say skeeved me out a bit. I am not sure I would read this one, but I do have an Oates on my list of review books that I am going to be getting to soon, so I will have to report back on what I think. I am also a little wary of the audios right now, and am stuck in the middle of The Emperor of all Maladies: A Biography of Cancer. It's interesting, but slow going. I've read Joyce Carol Oates because I've felt I had to but I just don't care for her. I can appreciate she is a incredibly talented author she's just not the author for me. Needless to say I'll be giving this one a pass. Great review though. Well, I've never read JCO but feel like I need to since she is such a celebrated author. Like Heather, I'm a little creeped out by the young girl/old man thing. Hey I know it happens, but I don't like to have my nose rubbed in it! As for the audio, it makes me sad this wasn't a win for you. I swear there are so many great ones out there! I've never read this one but I struggle with audiobooks. My mind wanders and I just can't hold on to what I am listening to in the same way I can when I am reading those same words from the pages of a book. I like audio books and do enjoy listening to them once in awhile. They're wonderful on long car trips, especially. I have friends who regularly listen to audio books on their 8 hour car trips to NJ from Ohio. It really does help pass the time. Some people say they're too distracting, but I've never found them so. I will sometimes listen to audio books while I work. Some of my favorites: PRIDE AND PREJUDICE read by Samantha York. CROCODILE ON THE SANDBANK by Elizabeth Peters. O'JERUSALEM by Laurie R. King. The vintage mysteries of Ngaio Marsh. I've also had great success with the stories of Arthur Conan Doyle. I have to admit, I've never listened to a serious 'literary' novel on audio. I have just begun to venture into the world of audiobooks. I, too, am currently listening to Never Let Me Go and I am loving it. I'm curious about what you think about it. I have a feeling I wouldn't like this one if I was reading it, which fascinates me. Anyway, I'm interested to know which audiobooks you have found to be exceptional. I'm never sure which book I should attempt, so any recommendations you can give would be much appreciated. Oates is one author that has not worked for me in the past. I do have (2) other books of hers that I still want to try. i have not read this but although i like her writing and can absolutely appreciate the gorgeous balance she gives a line, i am always left feeling a bit desolate after i read her. the voice is so crucial for the audio book and changes so much. I've read a few of her novels and am quite a fan. The ones I have read are Foxfire, The Falls and The Gravekeepers Daughter. She writes gothic novels and I like that. I am going to see her at a Library Event next week. She is speaking about her memoir, A Widow's Walk. I've yet to read Oates. Thanks for an honest review. I guess I won't start with this one. I've never read Oates. I haven't made up my mind yet where to start. I have found, though, that it's often the books I don't really like or have mixed feelings about that stick with me. I tend to find myself thinking about them more than the ones I love! I've never read anything by Joyce Carol Oates, but it doesn't sound like this is the one I want to start with. I think I agree with you too, there are some things/scenes that I'm better off reading than hearing or seeing. I love Joyce Carol Oates, but her writing is uncomfortable and can be dark and disturbing. I can read about a book or two of hers a year, and that is all - a little JCO goes a long way. She is definitely worth reading but none of her books are really feel good books. I've never read Oates, but like many of the commenters, I've heard her writing can be uncomfortable at times. This does sound interesting though, and like you, I'm trying to expand into audio (must do something with the 1.5-2hrs I spend in the car each day! ).